An interrupt is a signal sent to the ARM processor from a hardware device, indicating that the device requires attention. One is sent, for example, when a key has been pressed or when one of the software timers needs updating. This sending of a signal is known as an interrupt request. RISC OS deals with the interrupt by temporarily halting its current task, and entering an interrupt routine. This routine deals with the interrupting device very quickly - so quickly, in fact, that you will never realise that your program has been interrupted. Interrupts provide a very efficient means of control since the processor doesn't have to be responsible for regularly checking to see if any hardware devices need attention. Instead, it can concentrate on executing your code or whatever else its current main task may be, and only deal with hardware devices when necessary. Additionally, external hardware such as expansion cards may cause new interrupts to be generated. For example, the analogue to digital convertor on the BBC I/O expansion card can interrupt when it has finished a conversion. It is therefore possible to install routines which deal with these new interrupts. Each potential source of interrupts has a device number. There are corresponding device vectors; installed on each vector there is a default device driver that receives only the interrupts from that device. Unless you are adding your own interrupt-generating devices to the computer, you should not need to alter the interrupt system. See the chapter entitled IOC registers for more details. Not all RISC OS computers use the same interrupt generating hardware. Early models (eg the Archimedes 300, 400 and 500 series, and the A3000) use a variety of peripheral control chips; current models (eg the A5000) use the 82C710 or 82C711 chip; future models may use other peripheral controllers. These different peripheral controllers are mapped differently onto the IOC chip's IRQ registers. Consequently, device numbers differ between models of RISC OS computers. You can distinguish between the different peripheral controllers and their properties by calling OS_ReadSysInfo using its various reason codes. Note that RISC OS 2 does not support the 82C710 or 82C711 peripheral controller. Just like other vectors in RISC OS, you can claim the device vectors and get them to call a different routine. You do this using the SWI OS_ClaimDeviceVector. Most of the device vectors only call the most recent routine that claimed the vector. There is no mechanism to pass on the call to earlier claimants, as it is not sensible to have many routines handling one device. However, old claimants remain on the vector, and if you release the vector using OS_ReleaseDeviceVector, the previous owner of the vector is re-installed. The exceptions to this are device vectors 8 and 13, which handle FIQs and IRQs (respectively) which are generated by expansion cards. 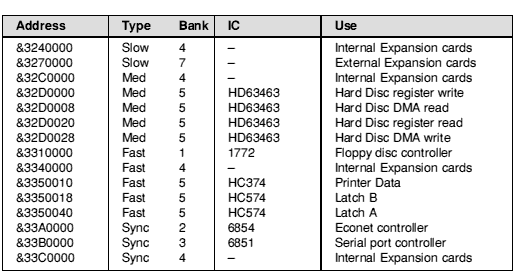 These can have many routines installed on them, as it is possible to add many expansion cards to the computer. Each claimant specifies exactly which interrupts it is interested in; RISC OS then ensures that only the correct routine is called. Note that when you claim a device vector, RISC OS will automatically remove from the chain any earlier instances of the exact same routine (ie one that uses the same code and workspace). If you release a device vector, and there are no earlier claimants of that vector, RISC OS will automatically disable interrupts from the corresponding device. You must not attempt to disable the interrupts yourself. There is thus guaranteed to be a device driver for each device number that can generate interrupts. After the release of RISC OS 2, a module called IRQUtils was released to improve interrupt latency. The changes this made have now been incorporated in RISC OS 's kernel. A dummy module named IRQUtils has been included with an appropriate version number, so that applications written to run under RISC OS 2 that check for its presence will still run correctly. This call installs the device driver, the address of which is given in R1, on the device vector given in R0. If the same driver has already been installed on the vector (ie the same parameters were used to install a driver) then the old copy is removed from the vector. Note that this call does not enable interrupts from the device (cf OS_ReleaseDeviceVector). The previous driver is added to the list of earlier claimants. If R0 = 8 or 13 then the device driver routine is for an expansion card. R3 gives the address where the expansion card's interrupt status is mapped into memory - see Interrupt Status Pointers onwards of the chapter Expansion Cards and Extension ROMs. Your device driver is called if the IOC chip receives an interrupt from an expansion card, and ( LDRB [R3] AND R4 ) is non-zero. For all other values of R0, your driver is called if the IOC chip receives an interrupt from the appropriate device, the corresponding IOC interrupt mask bit is set, and your driver was the last to claim the vector. This call removes a driver from the list of claimants of a device vector. The device driver is identified by the contents of the registers on entry; R0 - R2 (R0 - R4 if R0 = 8 or 13) must be the same as when the device driver was installed on the vector. The previous owner of the vector is re-installed at the head of the chain. If there is no previous owner, then IRQs from the corresponding device are disabled. You must not attempt to disable a device's IRQs within IOC when you release its vector. For expansion card IRQs (ie R0 = 8 or 13 on entry), you should prevent your device from interrupting again by programming the hardware on your expansion card. you wish to change one of the default RISC OS device driving routines. The device that needs attention alters the status of its interrupt request pin, which is connected to the IOC chip. The corresponding bit of one of the IOC's interrupt status registers is set. The IOC's interrupt status registers are ANDed with its interrupt mask registers, and the results put in its interrupt request registers. If the result was non-zero (ie the device's bit was set in the mask) then an interrupt is sent to the ARM processor. If interrupts are enabled, the ARM saves R15 in R14_irq. It then forces IRQ mode by setting the M1 bit and clearing the M0 bit of R15, and disables interrupts by setting the I bit. The ARM then forces the PC bits of R15 to &18. The instruction at &18 is fetched and executed. It is a branch to the code that RISC OS uses to decode IRQs. 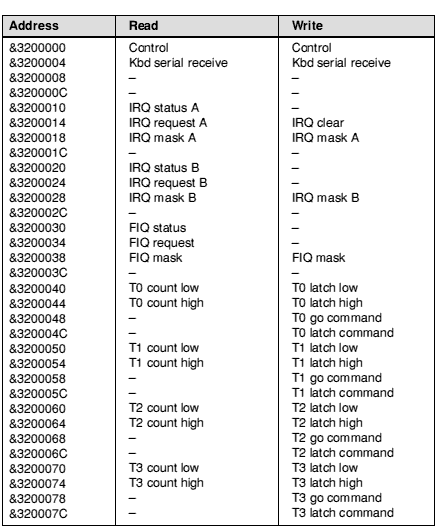 RISC OS examines the interrupt request registers of the IOC chip to see which device number generated the interrupt. If the device number was not 8 or 13 (ie the device was not an expansion card) then RISC OS calls the last routine that claimed the corresponding device vector. If the device was an expansion card, RISC OS checks each routine on the expansion card device vector, starting with the most recent claimant. The contents of the interrupt status byte are ANDed with the mask (as passed in R3 and R4 when the routine was installed). If the result is non-zero, the routine is called; otherwise the next most recent claimant is checked. Whatever the device number, if no routine is found to handle the interrupt then IrqV (the unknown IRQ vector) is called. By default this disables the interrupting device by clearing the corresponding bit of its interrupt mask - but the call may be intercepted by routines written to work under the old Arthur operating system. The device driving routine is executed and returns control. The addresses of the IOC registers are given in the IOC registers. R12 has the same value as R2 had when the vector was claimed - this is usually used to point to the routine's workspace. return to the kernel using the instruction MOV PC, R14. In doing so, you may corrupt registers R0 - R3 and R12. Interrupt handling routines must be quick to execute. This is because they are entered with interrupts disabled, so while they are running other hardware may be kept waiting. This slows the machine down considerably. where I_bit is a constant having only the I bit set. You cannot simply do TEQP PC,#I_bit, because in this instruction the PC is presented without the PSR bits. For more details see Appendix A: ARM assembler. If your routine does re-enable interrupts, it must be able to cope if a second interrupt occurs, and hence the routine being entered for a second time (ie re-entrancy occurring). A SWI is called by a program that is running in User mode. R15 (the return address to the program) is copied to R14_svc, and the processor is put into SVC mode. The SWI routine is then entered. While this routine is running, an interrupt occurs. The device driver routine calls a second SWI. The ARM enters SVC mode, and R15 is copied to R14_svc, overwriting the return address to the program. The second SWI executes. Control is returned to the interrupt handler. When it finishes, control passes back to the first SWI routine by loading R14_irq back into R15. The first SWI routine finishes executing, and tries to return control to the program by loading R14_svc back into R15. Because R14_svc was overwritten by the second SWI, control is not returned to the program; instead it passes back to the second SWI again, crashing the computer. SVC_Mode is 3. Of course, you must preserve R8 and R9 as well, using the full descending IRQ stack. If you want to check flags on exit from the SWI (eg the V flag), you must do so before you re-enter the original processor mode, as this method restores not just the mode bits, but also all the original flags. Interrupt handling routines must only call error-returning SWIs ('X' SWIs). If you do get an error returned to the routine, you cannot return that error elsewhere. Instead you must take appropriate action within the routine. You may also like to store an error indication, so that the next call to a SWI in the module that provides the routine (or the current call, if already threaded) will generate an error. The SWI is called from a program. It stores some values in the workspace. An interrupt occurs. The interrupt handling routine calls the same SWI a second time. The old values in the workspace are overwritten. When control returns to the first instance of the SWI, the workspace is corrupted and so the routine does not work correctly. undefined - the SWI's re-entrancy depends on how you call it, or it is subject to future change. In general, OS_Byte and OS_Word calls can be used. OS_WriteC and routines which use it should never be called. Before your routine returns, it must service the interrupt - that is, give the device the attention it needs, which originally caused it to generate the interrupt. You must then clear the interrupt condition, to stop the device carrying on generating the same interrupt. How you do this depends on the device, but will usually involve accessing the hardware that is generating the interrupt. See the relevant hardware data sheets for information. There are actually two classes of interrupt requests. So far we have been looking at the normal interrupt request, or IRQ. The second type is a fast interrupt request, or FIQ. Fast interrupts are generated by devices which demand that their request is dealt with as quickly as possible. They are dealt with at a higher priority than interrupts (ie normal IRQs). Fast interrupts are a separate system. There are separate registers in the IOC chip, separate inputs to the chip, and a separate connection to the ARM. The ARM has a processor mode reserved for FIQs, and a hardware vector. Devices handled under FIQs also have device numbers. Again, the device numbers correspond to the bits in IOC registers: these are the FIQ interrupt registers. Again we make the point that RISC OS 2 does not support the 82C710 or 82C711 peripheral controller. FIQs must never call SWIs. When a FIQ is generated execution passes directly to code at the FIQ hardware vector. By default, the code that is installed here handles FIQs generated by the Econet module, if it is present. The Econet module is the default owner of the FIQ vector. When other parts of RISC OS want to use FIQs, for example to perform a disc transfer under interrupts, they claim the vector, replace the default code, and then release the vector. RISC OS automatically re-installs the default code. Obviously only one current FIQ owner is supported. It is vital that you only claim the FIQ vector for the absolute minimum time necessary. For example, ADFS uses FIQs to perform disc transfers; but it releases the FIQ vector between each sector. Claim FIQs using the module service call OS_ServiceCall. You can claim FIQs either from the foreground, or from the background. To claim from the foreground, the reason code in R1 must be &0C (Claim FIQ). This service call will always succeed, but will wait for any current background FIQ process to complete. To claim from the background, the reason code in R1 must be &47 (Claim FIQ in background). This service call may fail, but this failure does not imply an error - merely that FIQs could not be claimed. You must leave your routine to allow the foreground routine to finish using FIQs and release them. You should schedule a later retry; for example with a disc, you would retry next revolution of the disc. If R1 = 0 on return, you successfully claimed the FIQ vector. Set the IOC fast interrupt mask register to &00, to prevent fast interrupts while you are changing the FIQ code. Poke your FIQ handling routine into addresses &1C upwards. You may use memory up to location &100 (ie the last possible instruction is at &FC). Enable FIQ generation from your device. Set the bit corresponding to your device in the IOC fast interrupt mask register. Start your FIQ operation. You must either poll for its completion, or rely on the completion starting the finalise process in the steps below. Set the IOC fast interrupt mask register to zero. Disable FIQ generation from your device. Release FIQs using the module service call OS_ServiceCall. The reason code in R1 must be &0B (Release FIQ). It doesn't matter which way you originally claimed the FIQ hardware vector. The device that needs attention alters the status of its fast interrupt request pin, which is connected to the IOC chip. The corresponding bit of the IOC's fast interrupt status register is set. The IOC's fast interrupt status register is ANDed with its fast interrupt mask register, and the result put in its request register. If the result was non-zero (ie the device's bit in the mask was also set) then a fast interrupt is sent to the ARM processor. The ARM saves R15 in R14_fiq. It then forces FIQ mode by clearing the M1 bit and setting the M0 bit of R15, and disables all interrupts by setting both the I bit and the F bit. The ARM then forces the PC bits of R15 to &1C. The FIQ handling routine at &1C is entered. The addresses of the IOC registers are given at the end of the chapter. There will be times when you want to disable interrupts (ie IRQs). You must only do so with great care; and particularly not for long periods of time since this will have various unwanted effects such as stopping the clock, disabling the keyboard, etc. The easiest way to disable and re-enable interrupts from user mode is to use the SWIs provided. These are OS_IntOff and OS_IntOn. They have no entry or exit conditions, and are described in full below. To disable specific devices, or fast interrupts, you need to be in a privileged mode. The example below shows you how to use the SWI OS_EnterOS to enter SVC mode. This is described in more detail below. Normally you won't need to do this, because RISC OS places you in a privileged mode during module initialisation, service and finalisation entries -the times you are most likely to want to disable devices, or fast interrupts. Once you are in a privileged mode, you can disable interrupts by setting the I bit in R15. You can also disable fast interrupts by setting the F bit. FIQs must be disabled because the mask has FIQ downgrade bits. If the current FIQ owning process alters these bits between your reading the mask and writing it, the process will not then get the IRQ that it just requested the FIQ be downgraded to. This service call must be issued by any module immediately after it releases the FIQ hardware vector. You may claim this service call if you wish to usurp the default FIQ owner (the Econet module) and install your own code on the FIQ hardware vector. If no module claims this service call, then Econet does so, and installs its own code on the FIQ hardware vector. Should even Econet not claim the service call - for example if the Econet module has been unplugged - then the kernel installs its default FIQ handler. See the chapter entitled Using FIQs for details of other steps to take when claiming or releasing the FIQ hardware vector, and also the chapter entitled Hardware vectors for additional information about the vector. This service call must be issued by any module running as a foreground task (ie not as an IRQ process) that wishes to claim the FIQ hardware vector. It informs the current FIQ owner that it must release the vector as soon as it can cleanly do so. The current owner must complete without disruption any unfinished FIQ processing, release the vector, and then claim the service call by setting R1 to zero. As soon as the claimant finds that the service call has been claimed, it knows it has claimed the FIQ hardware vector. This service call must be issued by any module running as a background task (ie as an IRQ process) that wishes to claim the FIQ hardware vector. It may also be issued by foreground tasks that wish to poll the FIQ vector for availability. Unlike Service_ClaimFIQ, this call may return with R1 preserved (ie not claimed), meaning that the current FIQ owner has not released the vector. The service call informs the current FIQ owner that it must release the vector if it can immediately do so. If the current owner is busy with a FIQ, it must take no action, merely passing on the service call; if however it is idle, it may release the vector and then claim the service call by setting R1 to zero. If the claimant finds that the service call has been claimed, it knows it has successfully claimed the FIQ hardware vector; however, if the claimant finds that the service call has not been claimed, it knows the current owner has not released the FIQ hardware vector, in which case the claimant may reissue the service call at a later time. Background claims are released by Service_ReleaseFIQ, as before. This call enables interrupts and returns to the caller with the processor mode unchanged. This call disables interrupts and returns to the caller with the processor mode unchanged. This call returns to the caller in SVC mode. This leaves you using the SVC stack. The interrupt states remain unchanged. It will help you to use interrupts to their full potential if you have a good knowledge of the hardware used to build the computer. We don't have the space to give you full details of every RISC OS computer built by Acorn in this manual. Below we tell you where the IOC chip and some of the various peripheral controllers of a RISC OS computer are mapped into memory on an Archimedes computer. Although these may be taken as typical of RISC OS computers, there is no guarantee that other computers will be similarly mapped. Indeed, even the details below are subject to change; the peripheral controllers may be changed as improved ones become available, or the mapping may be redefined. Always use defined software interfaces in preference to directly accessing the hardware.